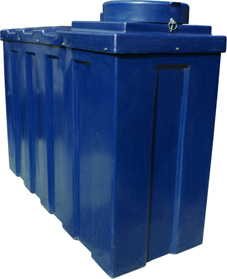 Our slimline adblue tank is one of the thinnest 1000 litre tanks on todays market. Its unique ribbed sides on the tank and new strengthened lid , creates a strong durable tank. All of our Adblue tanks are manufactured from a tough plastic called MDPE (medium density polyethylene) in our UK factory. This makes this adblue tank weatherproof and impact resistant. We only use high quality plastic to create our tanks, which means you can be assured your buying a first grade product. As security is very important to us, with regard to keeping your fuel safe, all of our Adblue tanks come fitted with a hasp and staple which can be used with a padlock. Using the fuel inside your tank could not be easier, positioned at the base of the tank is a 1" female BSP outlet.